I was super excited for this race since I would be running it with several of my Team AllEars teammates. We were going to make a long weekend out of it since I hadn’t been to Atlantic City since I was a teenager and Dave had never been. We flew in Friday night and we were delayed for several hours due to a nor-easter that was dumping rain and wind on the coast. We finally made it to AC around 11pm. We met up with some friends in Tun Tavern, the brewpub in the hotel, and had fun catching up and drinking beer. Saturday was spent cheering on our teammates doing the 5k and 10k. It was a cold, windy and pretty miserable that day and I was really hoping this wasn’t what the marathon would be like. We had a great group dinner at Angelo’s restaurant and went to bed early to be ready for the big day. We woke up Sunday and walked down to the start area from our hotel. It was not raining but it was still very windy, 25-30 mph. This was going to be an interesting day. 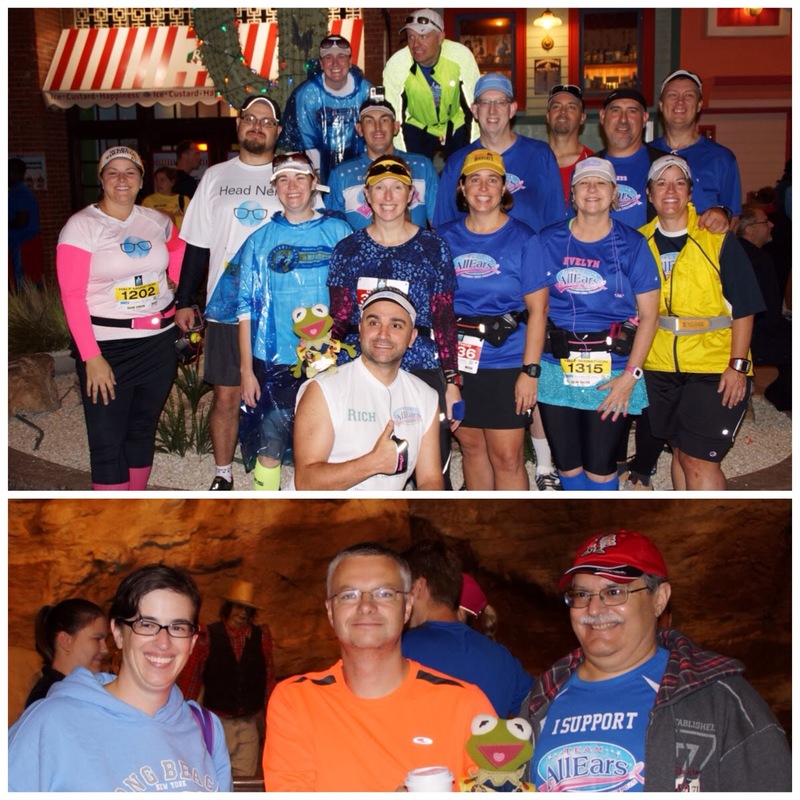 We were all standing inside Bally’s Casino to stay warm before the start. It was nice that we could walk out about 10 minutes before the start and get in the corrals. There were a bunch of us running either the half or the full. The full marathon group was Michael, Eddie, Rich, Helen and Charlie. The plan was to all stay together as long as possible, but we knew that that might not be possible. Joe was running the half but was going to stay with us until he had to make the turnoff. 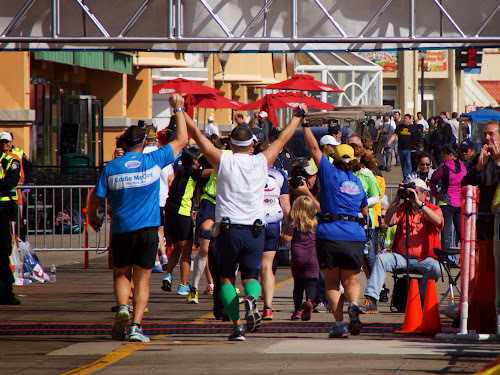 The best part of the whole race happened in the very beginning. We were slowly shuffling towards the start line when Michael says "Hey there is a sign that says Holly". I look over and it’s my Mom standing on a bench with the sign. I yelled, that’s my Mom! Then I look down and my Dad is standing right there. Totally surprised. I knew they were coming but did not think they would make the start. Perfect way to start the race. The course was pretty nice for the first half. We ran up the boardwalk and then out towards the marina area casinos. Only negative was running through a big tunnel. I do NOT like tunnels. I’m glad it was in the beginning and that it wasn’t a warm day. We then made our way back towards the boardwalk and ran down it. This was a nice section as there were a lot of spectators and the wind was towards our backs. Joe had to leave us at Mile 11 and we all wished him luck. We had a blast running with him and can’t wait to run his first full marathon with him in Philadelphia. We made it to the famous elephant, Lucy, even though somehow Rich couldn’t see the thing. We had Dave and my parents doing a great job of spectating all day. I was starving and asked for some orange slices and once again Dave came through. The second half of the course was not as nice as the first half. Lots of weird turns and the wind was really brutal. 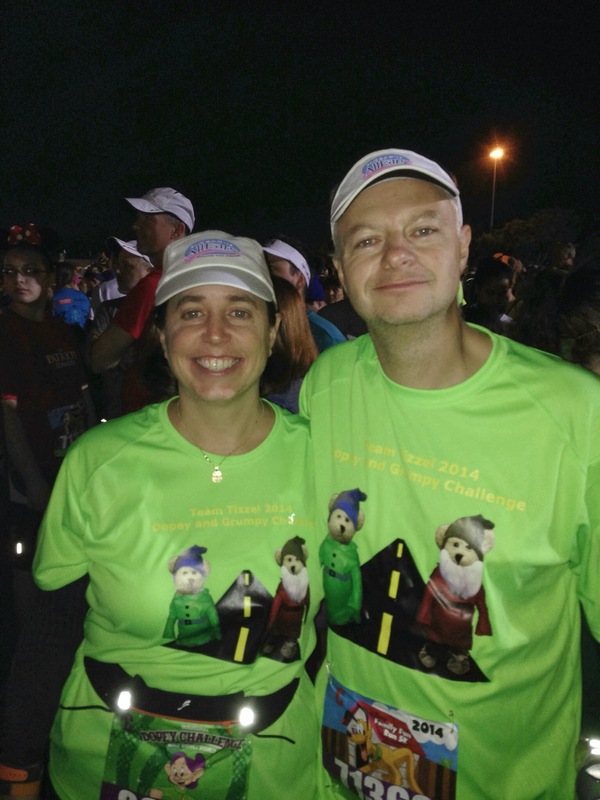 Helen was feeling great and she picked up the pace while Michael joined her. Charlie was struggling with stomach issues, so he had to drop back a bit. Eddie and Rich did a great job of keeping me company and keeping me from whining too much. 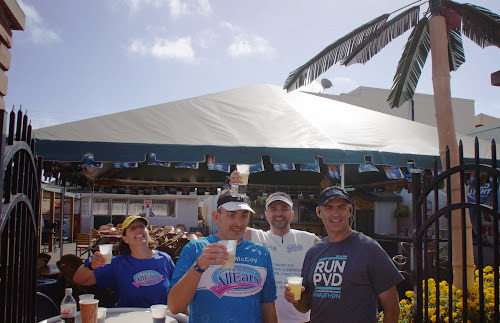 Dave arranged a wonderful beer stop around mile 21 and it was much appreciated!! 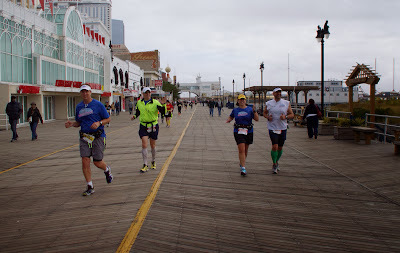 The last 5 miles were all into those 25 mph winds along the boardwalk. Beautiful view, but the last thing you need for the last 5 miles of the marathon. I was getting tired. 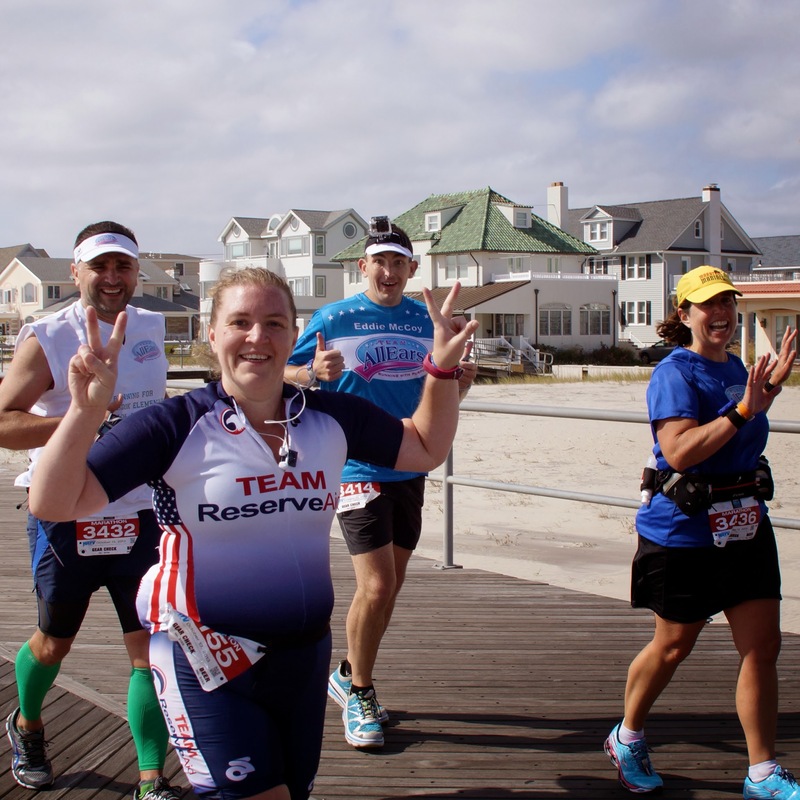 We met up with another runner, Katie, and she ran with us until the end. 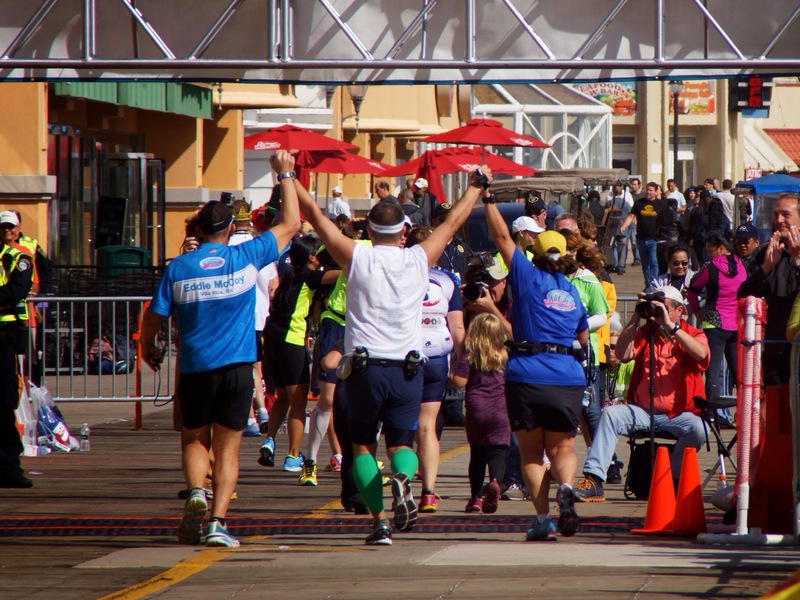 One scary thing happened at mile 25.5. Rich tripped on a nail on the boardwalk and went down HARD. I was really afraid he broke something. And contrary to reports I didn’t push him. I helped him up and we walked a bit to be sure he was ok. He had some nice road rash, but appeared ok. We were thankful to be close and ran it in with hands held high and big smiles on our faces. State number 18 is finished!! I was really pleased with my time. It was my best of the year. Still way off my PR, but I have been really trying to get back in shape since I hurt my foot and I am finally feeling like I am making progress. I’m hoping to do even better in Philly in November and will be excited to be running with my friends once again! Atlantic City was an easy marathon to follow. I moved the car closer to the Boardwalk and to the east side of MLK drive so we could make it to the early miles. At the start I indicated to the group that I'd be on their left. When I got to my spot I found a right-side viewing area made for better photos. Texted three folks ten minutes before the race, but no response. Guess they were having fun. After the start Holly's parents found me and we started trekking around the course. I drove to mile 2 and was confused as to why I couldn't see the race. We grabbed the map and noticed right by our location were the words "tunnel". Oppsie! We headed to MM 3/5.5. After seeing our runners we went back to the Boardwalk for a great view around Mile 8. We moved on and followed the course the rest of the way with stops every so often. Miles 17 and 20 were close to each other with the out-and-back. This was a perfect place to catch a beer break and to set one up for the runners. We made our way back to the finish area, stopping one more time along the beach. We made decent time back to the finish area and got a prime spot to cheer the team in. 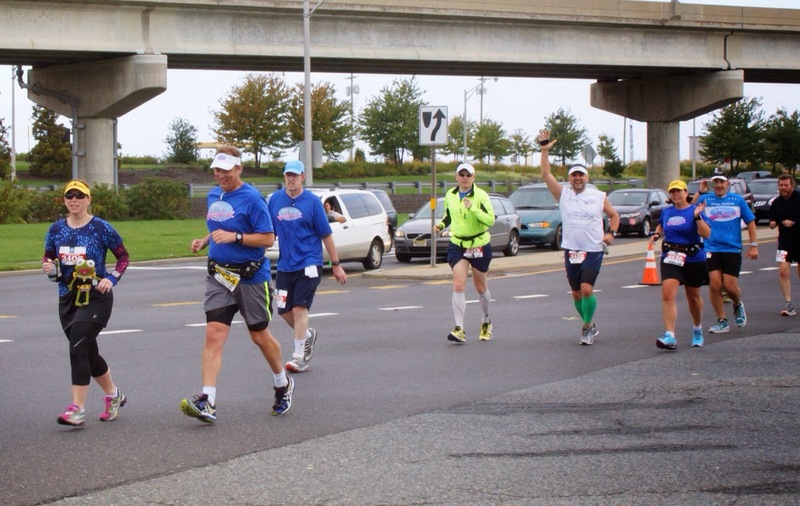 During the race we saw our runners 11 times when we pulled over and had about 4 other drive-bys. This was a great spectating course with lots of easy places to pull over and watch the race along with nice homes to look at once the race left the Boardwalk. 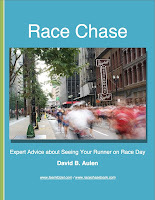 To find our runners so many times I used the tricks I talk about in our ebook Race Chase: Expert Advice about Seeing Your Runner on Race Day. It's available for immediate download and all proceeds go to our breast cancer fundraising, along with a matching donation from my company. 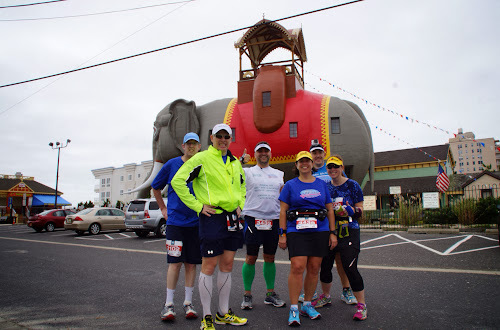 2013 Atlantic City Marathon from Eddie McCoy on Vimeo. The first weekend of October is the true nail-in-the-coffin for the Chain O' Lakes boating season. The weather turns more towards fall/winter and Blarney Island holds its Drink us Dry Weekend. The Saturday of this weekend showed rain in the forecast, so we didn't find the need to go to the island. Instead of hopping in the boat we traveled south to hop two local breweries we have never visited. 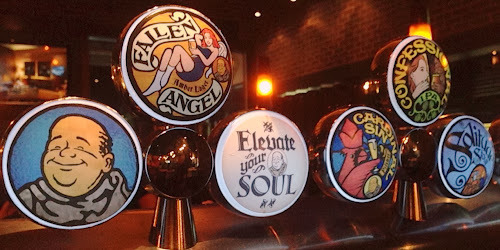 Our first stop was The Lucky Monk in South Barrington. 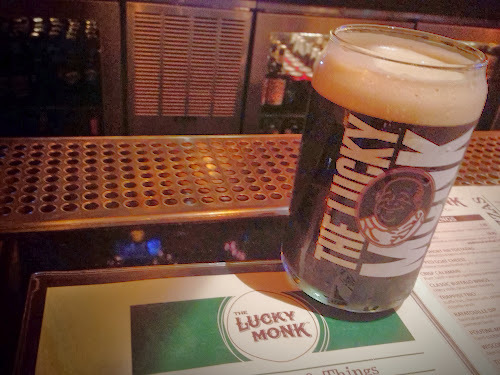 We first learned about The Lucky Monk when they were featured for pub grub on one of our favorite local shows, Chicago's Best. The building is in a stand alone location just outside of a mall. The inside was a bit bland, decorations were mostly wood barrels. We sat at the bar and ordered our first beers - Solitude Oatmeal Stout. It was good, but not an OMG. 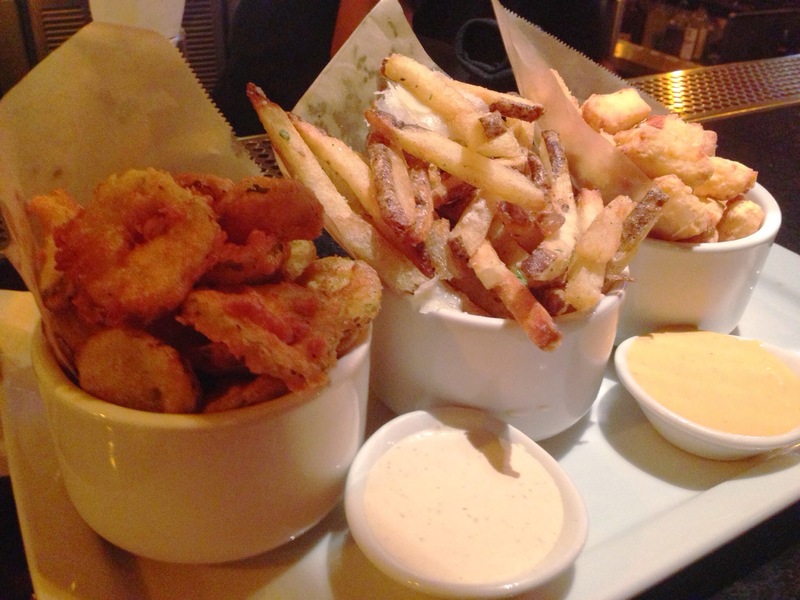 Since pub grub was supposed to be the highlight of The Monk we ordered a Trappist Trio: Fried Pickles, Truffle Fries, and Fried Cheese Curds. We hardly order anything like this for dietary reasons which partially explains why it was so good. Everything was seasoned and prepared properly and the three items went well together. We decided to split a burger instead of ordering a sandwich each. They had our new obsession on the menu: the peanut butter / bacon burger. Their version included bananas. We got the bananas on the side and upgraded to the side salad so fries wouldn't tempt us any further.... Dave liked the banana on the burger but Holly didn't. The peanut butter was closer to Skippy consistency vs. the homemade style at The Bad Apple (link to our post about it). The meat The Monk used was top notch and cooked to a perfect medium. If you mixed The Bad Apple's toppings and bun with The Lucky Monk's burger meat you'd have the perfect Elvis tribute. Dave sampled the Fallen Angel Amber and Holly tried the Pumpkin seasonal by Lakefront Brewery out of Milwaukee. The Amber was good and Holly liked Lakefront's product. Overall assessment was The Lucky Monk is a good spot to visit. The beer was good, not great, and the food was excellent. We won't make a special trip again, but would likely visit if we are in the area. 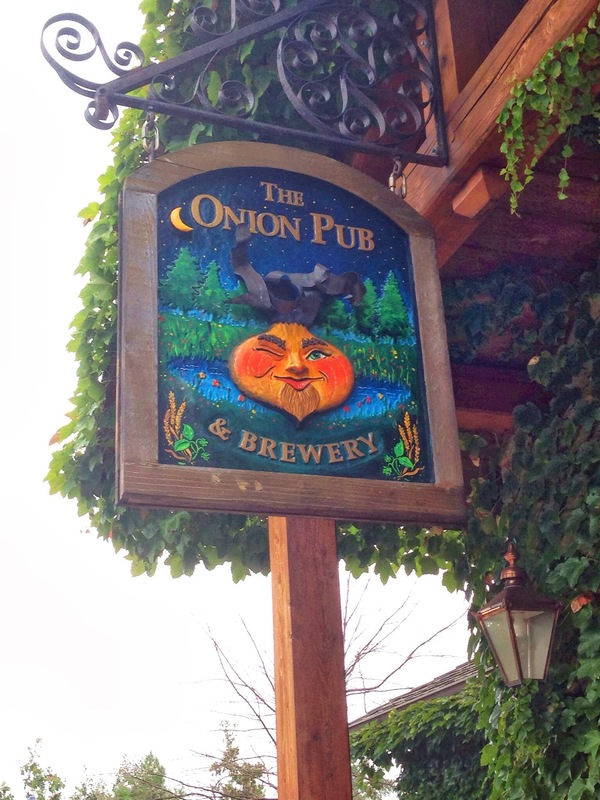 Our next stop on the way back north was The Onion Pub in Lake Barrington. The Onion was kinda tucked back in an industrial area. It had all the charm the monk was lacking with a Bavarian style building - complete with a mural of foxes in a beer hall. We were here for drinks only and wanted to try the Nut Brown. Of course they were out. We've bought their stout in cans at the grocery store so now we had to move onto some lighter beers. Holly went with the pumpkin seasonal and said its flavor profile was heavier on the spice vs. Lakefront's pumpkin (Lakefront won, but Onion's product was still very good). Dave went with a very cloudy hefeweizen - also very good. He sampled a blonde ale - Kainz Brau. Also tasty.... One thing we noticed about The Onion is that for a straight up restaurant (and not a sports bar) the place had a decent crowd at 3pm - lots of late lunches being ordered. Overall a fun stop on the tour. The Onion just started some expansion work. This article highlights their focus on sustainability, creating a hop garden out of a junk yard, and their endeavors in worm farming. 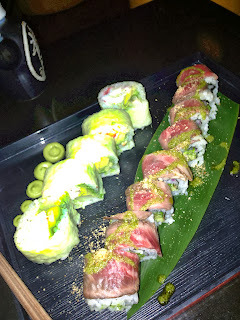 The morning after seeing the Jimmy Cliff show and dining at Takashi we made our way to The Adler Planetarium. Holly has wanted to visit this museum since she moved here in 1995. Getting there was interesting - we rented Divvy bikes. These are bicycles placed all around the city that you rent for 24 hrs at a time. 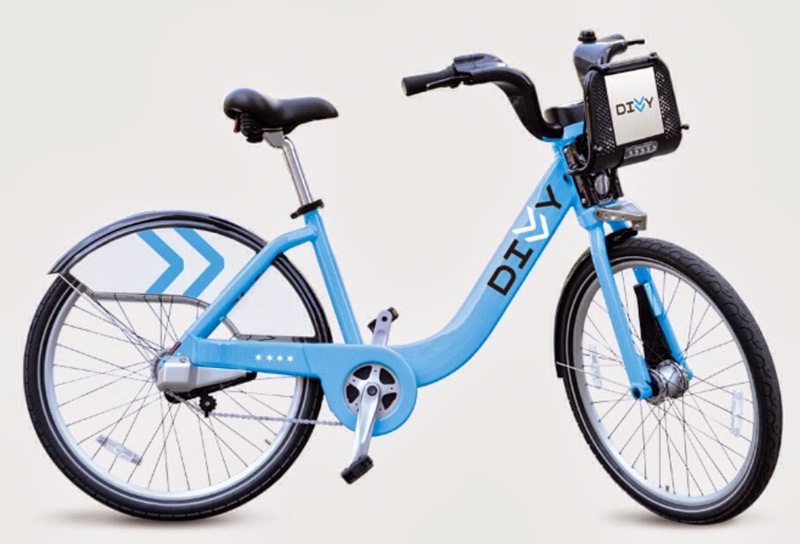 The catch: you have to re-check the bike into a station within a half hour of starting in order to avoid additional charges. A rack was luckily right outside our hotel. We were able to cut through Millennium Park and ride along Lakeshore Drive. That was the nice part. The not-nice part was the fact that there was only one rack in all the Museum campus and it was far from the Planetarium. Later when we were renting them to head uptown it took over a half hour to get a bike because of user errors by other guests and the misadventures of a family of ten trying to rent these things. The Planetarium was good, but didn't occupy us for more than 2+ hours. We watched two shows - one boring presentation with photos from the Hubble Telescope and another one starring Big Bird and Elmo. Staff members kept cautioning us that we picked a kid show (and we didn't seem to have any kids with us) and maybe wanted to go to another offering. Who would skip a show with Elmo talking to a Muppet from China? Time for lunch. Based on the success of Takashi's dinner we decided to try the chef's other Chicago concept: The Slurping Turtle. 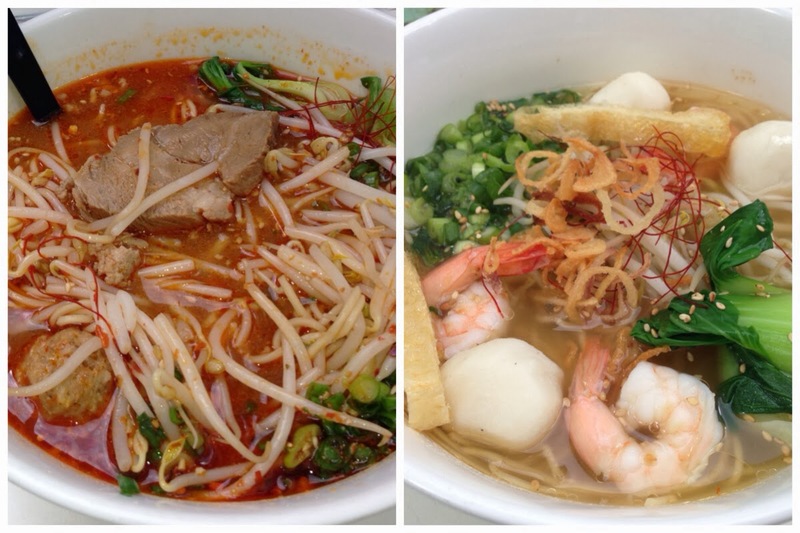 This is a more casual outlet with a lot of the focus on traditional ramen style noodle dishes. Dave's entree was much better than Holly's other than the fact that all the hot sauce was floating on the top and not mixed in. There was a good portion of meat in the bowl, but it all just seemed a little off. 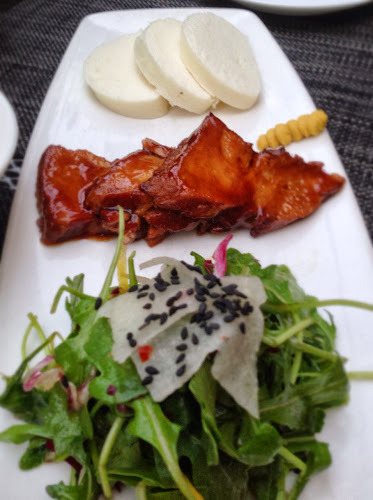 The best portion of the meal was getting a smaller serving of the pork belly appetizer we had the night before. After a little shopping and trying a Firecakes donut we stopped for a beer at Howells and Hood. This spot has a prime location in The Tribune Tower across from The Wrigley Building. 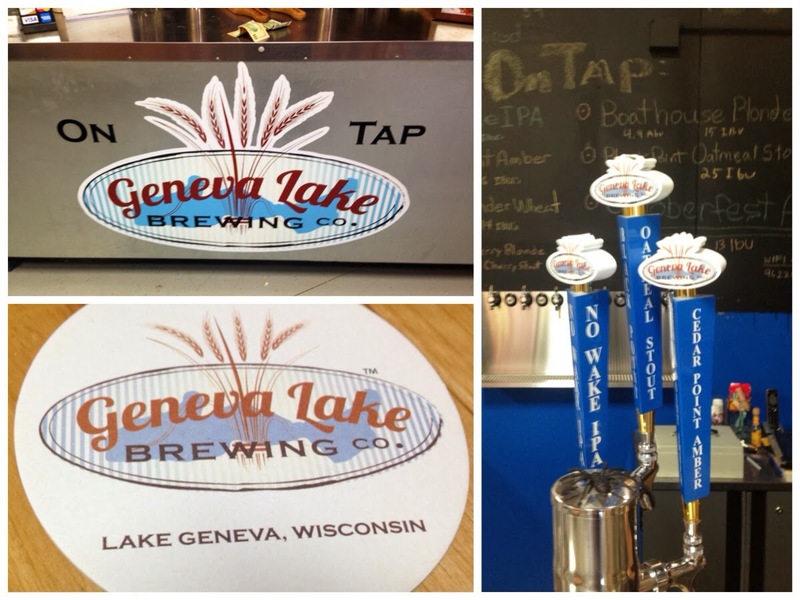 120 beers on tap with a decent local focus. Good spot. Usually when we go to Chicago we have a dinner reservation somewhere. 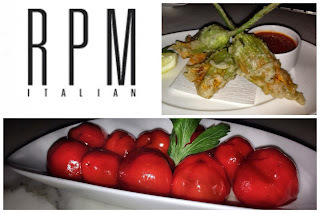 This time we decided to wing it - and by winging it we mean Dave came up with a list of restaurants to hop between - if it was too crowded at one place we'd move on..... First stop was RPM - made famous on Giuliana and Bill. The place was packed and it wasn't even 7pm yet. We stood by the bar and were able to get seats within ten minutes. 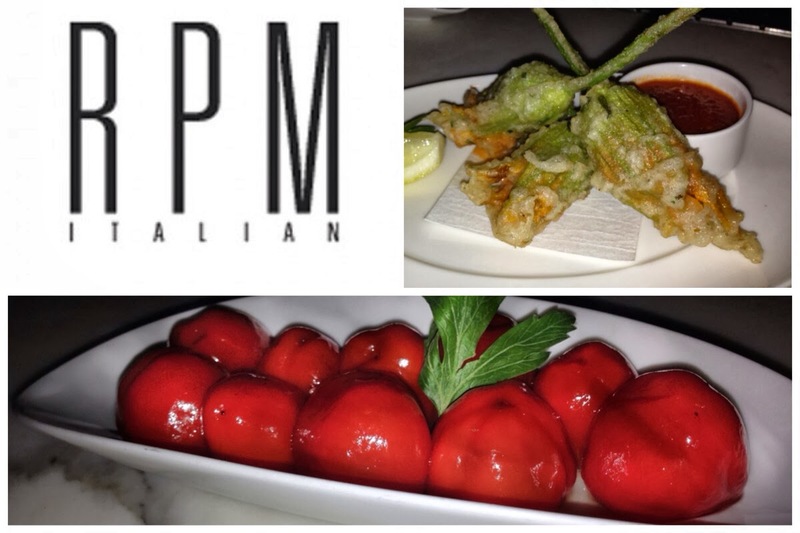 We tried two appetizers - provolone stuffed peppers and zucchini blossoms. Both were very good and some of the other food being delivered to other guests looked tempting. 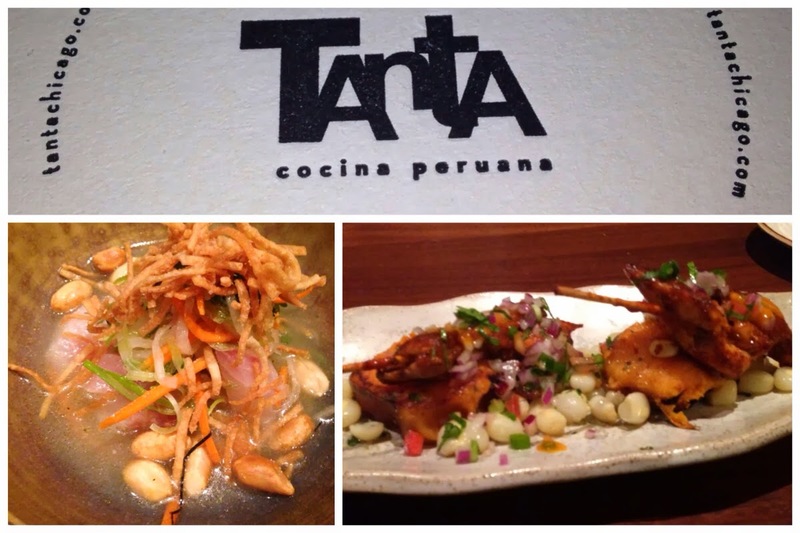 Our next stop was at one of Chicago's newest restaurants: Tanta. This is a Peruvian restaurant concept from The Emeril of Peru - Gaston Acurio. We've been looking forward to visiting this restaurant because we enjoyed two of his restaurants when we visited Peru last year. The place wasn't very big and it was very crowded. We again lucked into bar seats within 5 minutes of arriving. There were three staff members behind the bar desperately trying to keep up with the drink orders. 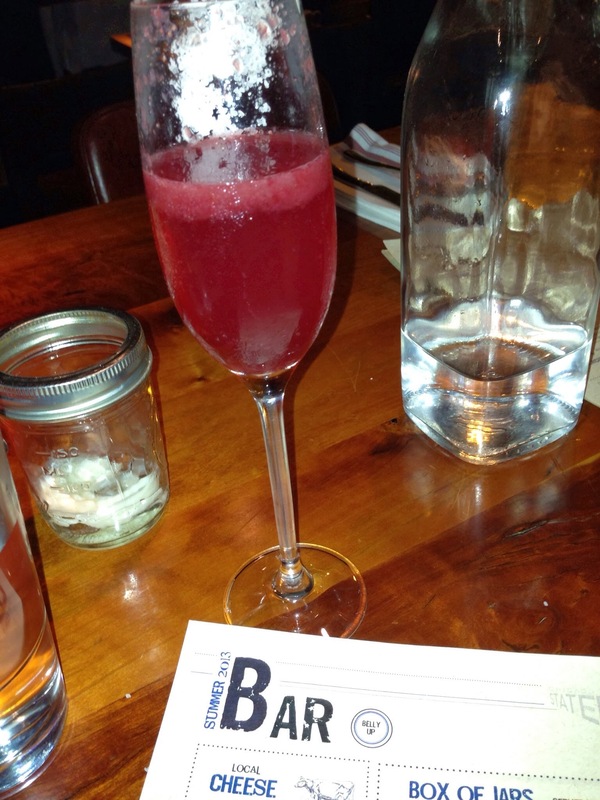 We found a nice selection of signature drinks using Pisco and some good beers available. We ordered the chicken skewers which came with mashed sweet potato and large kernels of Peruvian corn. We also finally tried cerviche. This version had a bit of a Thai influence - heavy on the cilantro and peanuts. Dave liked it, Holly not so much. Everything coming out of the kitchen to other diners looked good so I am sure we will return. The final dining spot was SushiSamba Rio. This is a large restaurant with a big sushi bar set in the middle. It had a dance club atmosphere with lower-lighting and in-house DJ. The cocktail bar area was small - about seven stools and two couch areas. We sat at a couch and had two rolls - one crab and one waygu. Both were enjoyable. Eventually we moved up to the bar seats and got to enjoy some people watching. Our bartender was one of the nicest servers we've ever had in Chicago. Another fun place to put on the comeback list. We decided to have a nightcap at the Conrad Hotel's bar since it was on the way. When we got to their bar and found it was in the middle of the bright lobby area we turned around to head to our hotel. We were at the Hyatt where we knew we had two decent bars to visit. Our only plan for the next day was to find a place on the north side of the city to get lunch. 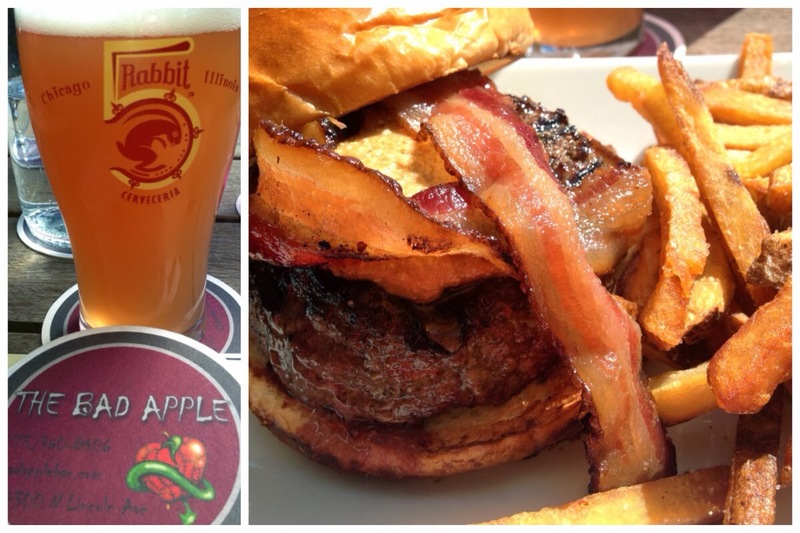 We were hungry for burgers and our research brought us to The Bad Apple. This corner location has a neighborhood bar feel covered in tattoo art. One of the most impressive things about The Bad Apple was the beer list. Huge! The only complaint about the list was the fact that it was sorted by country/state and not beer style. #firstworldproblems. 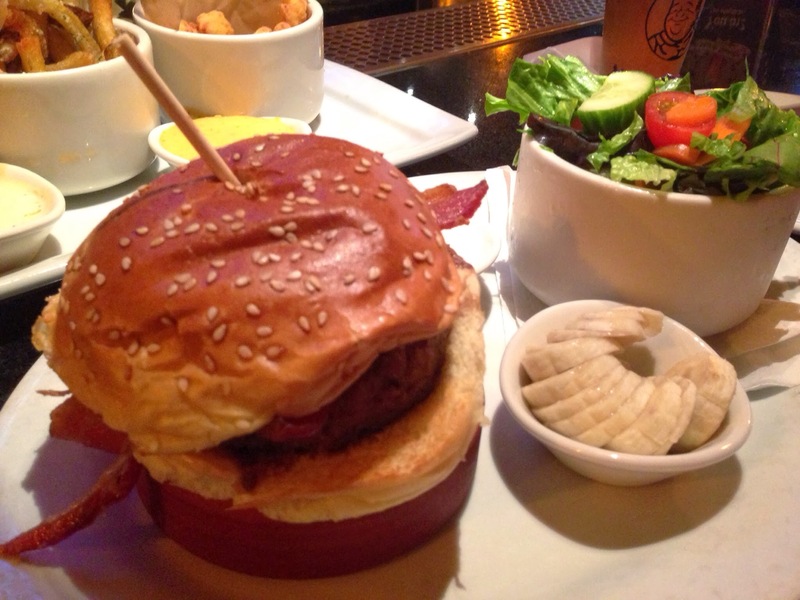 We decided to be daring and try their burger called The King: hamburger with peanut butter and bacon. Yeah sounds weird.........but it's our new obsession. The combination is fantastic. The Bad Apple used a homemade peanut butter that held to the heat of the burger. One thing we "lucked" into was Half Acre Brewing was across the street from The Bad Apple. 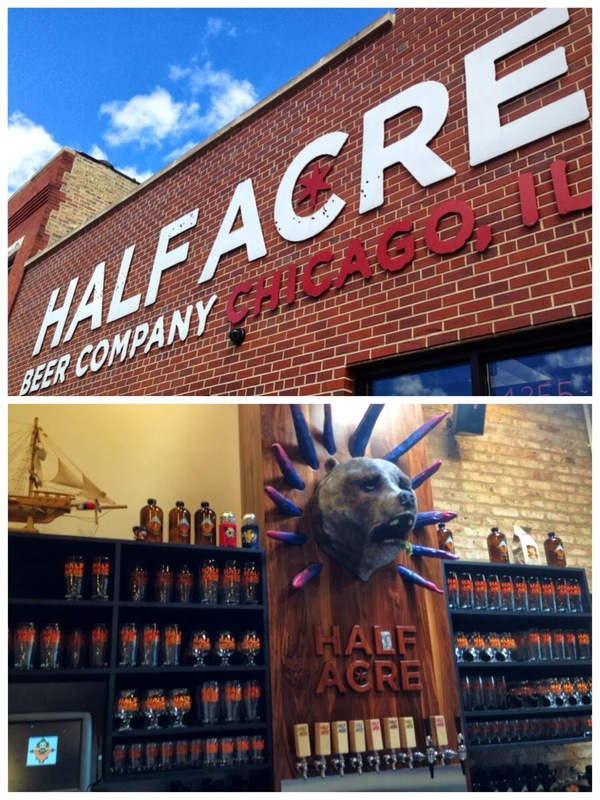 Half Acre was recently rated the best brewery in Illinois by one source. We've never been fans since their flagship product Daisy Cutter is nasty (hoppy). We figured let's sample a few other products to give them a fair-shake. The verdict: still bad. Everything was over-hopped, even styles that should be low on the IBUs and malt-forward. Half Acre is a one-trick pony. Overall a great weekend filled with lots of new experiences. I do a lot of running on the treadmill and I am always looking for good things to watch. I recently watched a very powerful documentary that I wanted to share. The documentary is My Run. It is the story of Terry Hitchcock, a 57 year old man who decides he wants to run from his home in Minneapolis to Atlanta. His goal was to arrive in time for the opening ceremonies of the 1996 Summer Olympics. He only had 75 days. Did I mention that he was not a runner when he came up with this idea? 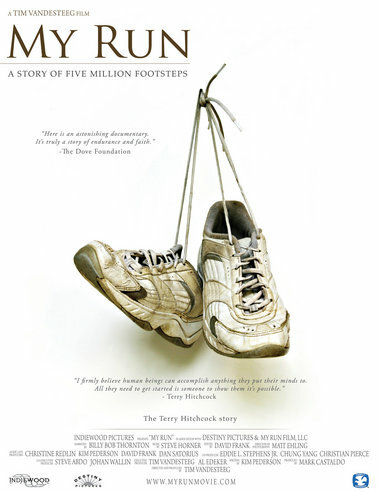 Terry had never run a marathon before and he basically would have to run a marathon every day for 75 days. This was 1996, before the marathon running boom we have now and I know people do feats like this all the time, but at the time this was ground breaking. The real reason I want you to watch it is the reason he wanted to do this run. Terry lost his wife to breast cancer and he was left to raise his 3 small children by himself. He wanted to raise awareness for the struggles of a single parent. Give it a watch and I guarantee you will be inspired. I know it helped me get through my long run that day. Remember October is breast cancer awareness month and you can help the cause by clicking the donate now button and making a donation. First, we will answer the question you just asked in your head: Jimmy Cliff is not dead. 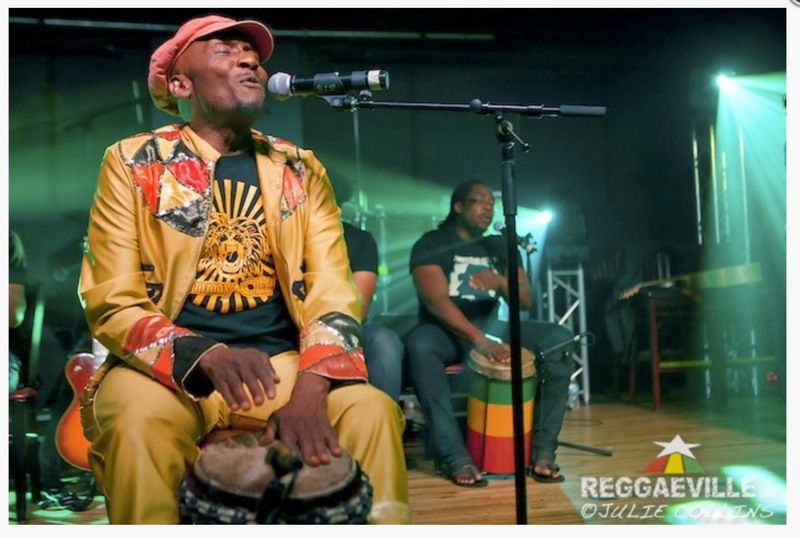 He's 65 years old and released a Grammy-winning album last year. 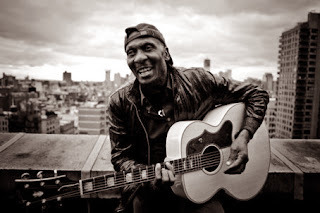 When Dave heard Jimmy Cliff was coming to Chicago, and it wasn't a race weekend, he expressed a strong interest in seeing the show. Jimmy was playing a new theater in Chicago, the Concord Music Hall, which appeared to be a nice sized venue for a show like this. Tickets were $34 each after service charges, general admission was the only option. The show was on a Friday so we'd still have the whole weekend to do other things. With that said, there were some downsides: The venue was in an area of the city we were unfamiliar with and not close to any lodging, Holly needed to get in 12 miles (straight) of running for her upcoming marathon, hotels were pricey that weekend, and reggae shows generally start late. But everything fell into place and we ended up spending two nights in the city. We cabbed from our downtown hotel to the Bucktown / Logan Square neighborhoods. Good research led us to find that The Map Room, one of Chicago's first craft beer focused bars, was just a block away from our chosen dinner location. This is a fun spot to have a couple of drinks at, but be warned, no kitchen. Dinner was at Takashi, a Japanese-French fusion Michelin rated restaurant run by Takashi Yagihashi (from Iron Chef and Top Chef). We chose to sit on the sidewalk patio to get that city-dining experience. Within 2 minutes we witnessed a car back into a taxi cab. Fun! 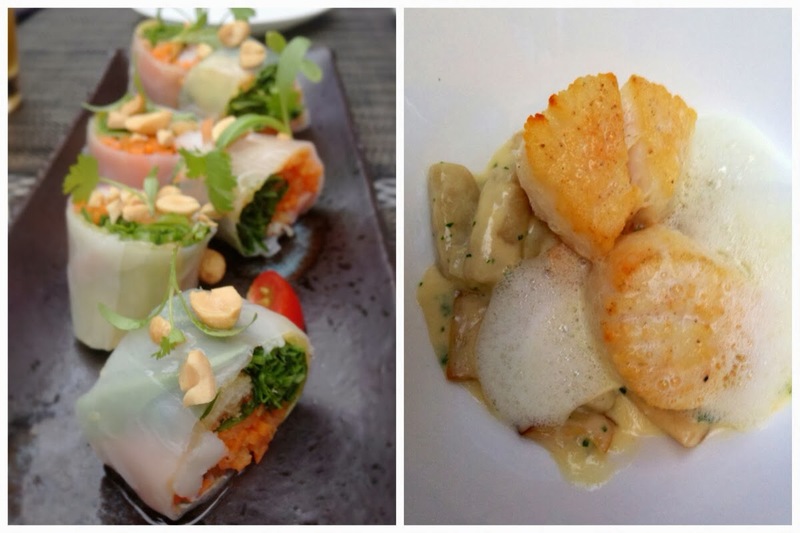 We shared three appetizers: tempura roll, scallops and gnocchi, and pork belly. All were excellent and could have been center-plate features on their own. Our favorite was the pork belly, which was served with pieces of steamed buns, greens, and spicy mustard. Diners were encouraged to make a sandwich out of the ingredients. Main entrees were next. 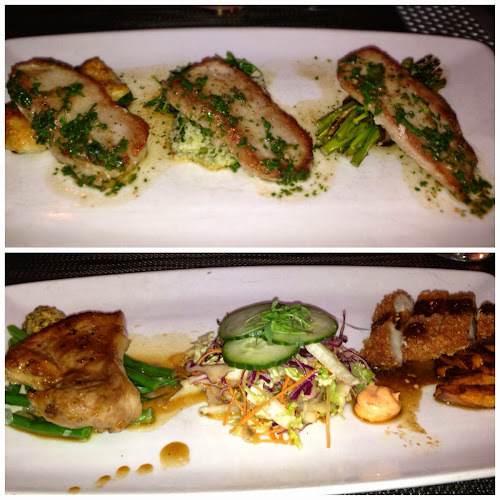 Dave had loin of veal and Holly had pork two-ways. Both were good, but overshadowed by the appetizers. If we visit Takashi again we are going all appetizers. 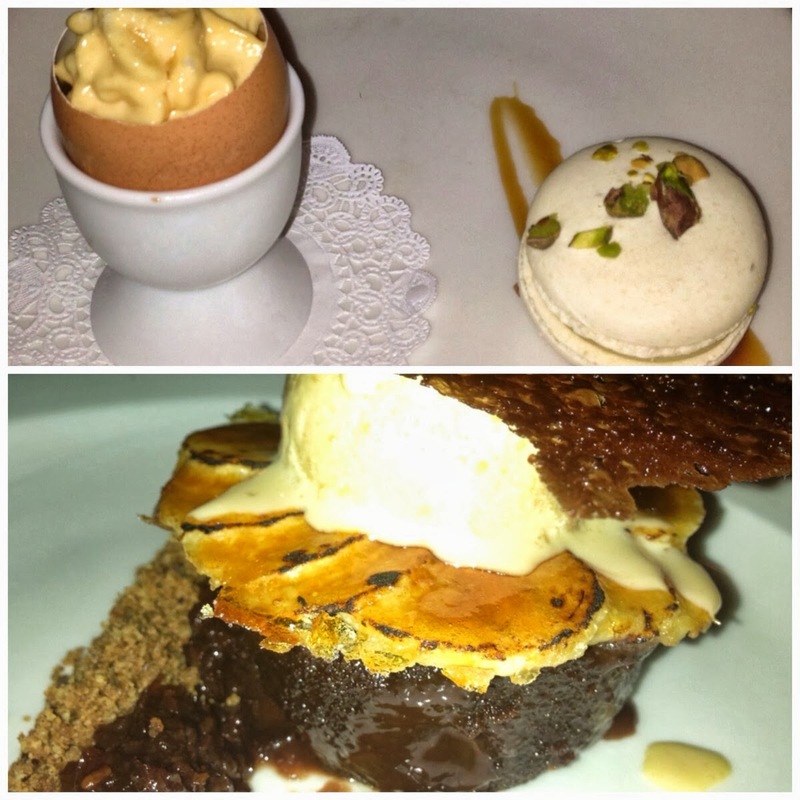 Finally dessert: Holly's was right up her alley...butterscotch panne cotta served in an eggshell with a pistachio macaroon. Dave had a chocolate cake with bananas and raisin paste. Both were great. Off to the show! Our plan was to get there close to when the doors would open. With Holly's current foot injuries it would not be a good idea for her to stand for hours. Fortunately the venue had a lot of seating in the back of the theater. The two long rows of booth-type banquettes filled up quickly. We were comfortable and figured once Jimmy came on stage we'd get up for a better view. Luckily, they opened one of two balconies. These areas were little enclosed rooms that offered a side-view of the stage. We were able to move up there and sat at a little table. There were glass windows protecting the people below from our potentially falling drinks. We hung out here for the opening DJ, opening singer (Ethan Tucker), and Jimmy's first number. Jimmy Cliff and his band started off with a ten-to-fifteen minute medley on the bongos. We couldn't hear too well from our balcony seats so we moved down to the main floor - much better sound. He played for about two hours doing his its as well as some covers of early ska songs. He was in high spirits and danced around a bit on stage. The audience was one of the most polite group of people we've every seen at a show. We certainly weren't the youngest folks here, but not the oldest by a long shot. There was a good mix of men and women and folks of all races. Towards the end of the evening we walked through the crowd to the front of the stage to get a close look and no one was putting up resistance (see how we worked in a Cliff lyric there?). We stayed close for two songs, then moved back because we were polite like that. The set list was full of hits, some we had even forgotten about. Cliff and crew put on a great show that night and we had lots of fun. 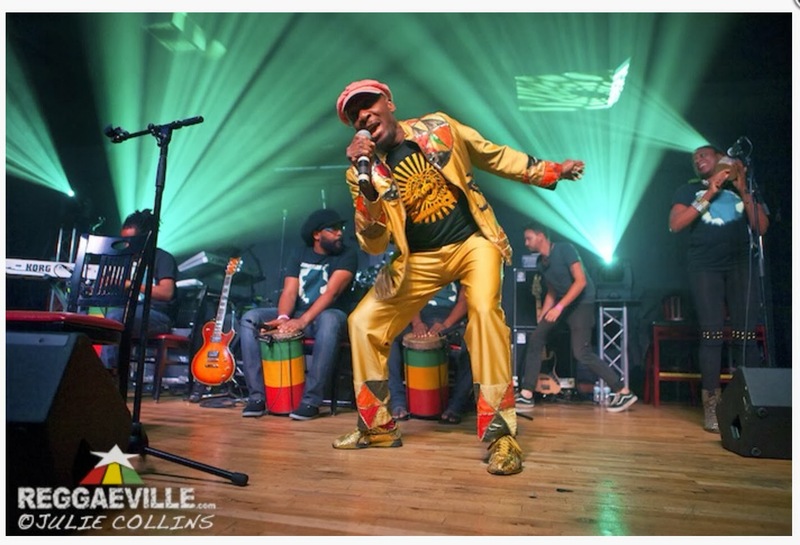 Our pictures from the show are grainy iphone photos so we'll share some from reggaeville.com. We left the venue close to 1am, found a cab, and decided we wanted one more drink. We weren't sure if our hotel bar would be open so we hit The Wit since Dave knew they had a rooftop bar that would likely be open. We waited at the velvet ropes to talk to the hostess but heard her tell folks in front of us that the cover was $10 ladies and $20 men. Forget that! The main floor bar, State and Lake, was open and very nice. There was a guy playing guitar and singing..... Reasonable prices on drinks and bar snacks. Good way to end the night.